Are your tresses in need of some good old-fashioned TLC? Then you are definitely in the market for a hair mask that will rejuvenate, revive and revitalize those strands. And if you're like this beauty chick, you'd like it to keep your color vibrant and shining at the same time. 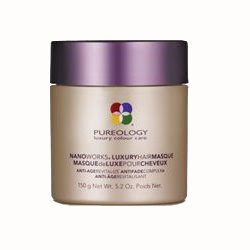 Look no further than the Pureology Nanoworks Luxury Hair Masque -- this tub is filled with a deliciously creamy formula that will make your locks glisten and gleam with the best of them. It takes a lot to drag me away from my Kerastase Masquintense, so when I first unscrewed the cap on this oversized tub I didn't expect to be impressed. Well, color me embarrassed -- I seriously fell in love as soon as the delectable blueberry scent wafted into my nose. And as I scooped out some of the thick, rich mask and coated my strands with it, I continued to fall more in love with every second. After only five minutes, my hair was sleek, shining and velvety soft. So what makes this mask so amazing, you might ask? It's formulated with tons of antioxidants like acai berry, pomegranate and blueberry, which contain Vitamins C and E to protect against the harmful effects of free radicals. But even cooler than that, Pureology's signature AntiFade Complex and Anti-Age Complex work to protect color and restore damaged locks. It even comes with a little comb to really make sure you comb the product through thoroughly and coat each individual strand. The end result is hair that's stronger, shinier and amazingly protected -- which is just so perfect considering beach-and-pool season is upon us! I've been using this mask religiously for the last two months -- once a week for five minutes -- and I can safely say my hair has never looked better. In addition to smelling absolutely fantastic, this mask really does make my hair sleeker, healthier and all-around gorgeous! If you're intrigued, you simply must pick up a tub for yourself, which you can do for $51.99 at sleekhair.com. If shiny strands are the key to happiness, then this beauty chick is definitely on cloud nine. Trust me, it is! And I never thought I'd find anything as good as Masquintense!